The News Corporation (or 'News Corp.') was an Australian, and later American, mass media corporation. It was based in New York City, New York. It was the world's second biggest media company in revenue in 2011, and the world's third largest company in entertainment in 2009. News Corporation was founded in Adelaide in 1979, by Rupert Murdoch. It was incorporated under South Australian commercial law until 2004 when the company moved to the United States. It was re-incorporated under Delaware law after its shareholders approved the move on 12 November 2004. It was a publicly traded company listed on the NASDAQ. Murdoch remained the chairman and chief executive officer of the company until its end in 2013. 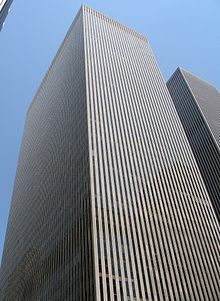 Among its major holdings were News Limited, News International (whose properties include The Times, The Sun, and the now-closed News of the World), Dow Jones & Company (which owned The Wall Street Journal), the book publisher HarperCollins, and the Fox Entertainment Group (owners of the 20th Century Fox film studio and the Fox Broadcasting Company). News Corporation was split into two different companies on 28 June 2013. Both are publicly traded companies: 21st Century Fox consists mainly of television and media assets, while a new News Corp focuses on publishing. All titles sourced from News Limited - NewsSource: Magazines on 15 October 2010. The Wall Street Journal - the leading US financial newspaper. Barron's - weekly financial markets magazine. Marketwatch - Financial news and information website. Dow Jones Newswires - global, real-time news and information provider. Factiva - provides business news and information together with content delivery tools and services. Dow Jones Indexes - stock market indexes and indicators, including the Dow Jones Industrial Average. Dow Jones Local Media Group (formerly Ottaway Community Newspapers) - 8 daily and 15 weekly regional newspapers. STOXX (33%) - joint venture with Deutsche Boerse and SWG Group for the development and distribution of Dow Jones STOXX indices. Vedomosti (33%) - Russia's leading financial newspaper (joint venture with Financial Times and Independent Media). Jamba! - Mobile Entertainment/Mobile Handsets Personalisation/Games. NDS Group (49%) - DRM and conditional access company. The following companies are subsidiaries of News Corporation that either are no longer active or have been absorbed into another part of the company. ↑ "News Corp investors agree US move". BBC News. 26 October 2004. Retrieved 27 March 2010. ↑ Fabrikant, Geraldine (7 April 2004). "Market Place; News Corp. Plans to Follow Its Chief to the United States". The New York Times. Retrieved 27 March 2010. ↑ "News Corporation". NewsCorp.com. 12 November 2004. Retrieved 13 August 2011. ↑ 4.0 4.1 4.2 4.3 4.4 4.5 "Financial Statements for News Corporation - Google Finance". Google. Google.com. Retrieved 11 July 2011. ↑ Siklos, Richard (9 February 2009). "Why Disney wants DreamWorks". CNN. Retrieved 20 May 2010. ↑ "News Corporation – Annual Report 2007". Newscorp.com. 30 June 2007. Retrieved 11 July 2011.